The following terms and conditions, along with your FREEDOM Card Registration, constitute your PATCO FREEDOM Card Agreement and shall also apply to all of your subsequent FREEDOM Card purchases. Please read the Agreement carefully and keep a copy for your records. Failure to comply with this Agreement may result in revocation of your FREEDOM Card. There is a $5 purchase fee for each PATCO FREEDOM Card. This fee is not refundable or available for use on the transit system. FREEDOM Cards expire in 10 years. Customers will be required to purchase a new FREEDOM Card after the initial card expiration. PATCO will transfer the balance remaining on your expired card to your new FREEDOM Card. If you choose to register your card for balance protection and the convenience of autoload, you agree that all information provided in your registration information is true, correct, and complete. It is your responsibility to ensure that the information you provided on your application such as credit card information, including the expiration date of your credit card, is updated as necessary to remain current. All information that you provide to PATCO in connection with your FREEDOM Card is subject to investigation and verification by PATCO. You authorize PATCO to contact your employer if you use the Transit Benefits program and the credit card company listed in your application if you used your credit or debit card. You have the option of registering your FREEDOM Card for balance protection. If you lose your card, you don't lose the value. Upon PATCO receiving notification from you of a lost card, we will deactivate your card and issue you a new FREEDOM Card. A $5.00 non-refundable replacement fee will be charged. If you have not signed up for balance protection, the value remaining on the lost/stolen/damaged card will not be available for transfer to a replacement card. The $5.00 replacement fee will still apply. PATCO's Reduced Fare Program allows eligible individuals to travel during off-peak hours for one half the lowest regular PATCO fare for travel. Customers must first complete an application process in order to be eligible for the RFP FREEDOM Card. RFP approved customers will receive a FREEDOM card Photo ID. All new RFP FREEDOM Cards will be valid for 5 years from the issue date. All RFP customers must re-register and receive approval to continue when the initial RFP FREEDOM card has expired. There will be no charge for customers exchanging their existing (expired) RFP FREEDOM Card. The FREEDOM Card is to be tapped on the FREEDOM target located on the Automated Vending Machines and at the faregate when entering and exiting the system. Do not insert your FREEDOM Card into PATCO Fare equipment. You will be charged a $5 fee to replace a card that was inserted into PATCO fare equipment. PATCO reserves the right to inspect your FREEDOM card at any time for damage or abuse. Values contained on multiple FREEDOM Cards may not be combined to pay fares. Each individual will be required to have their own FREEDOM Card to enter/exit the system. It is not possible to pass back a card and deduct multiple trips for multiple riders. 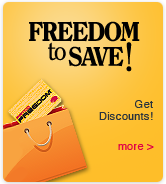 Customers can store a minimum of $20 to a maximum of $650 on the FREEDOM Card. Value can be added to the smart card using cash, credit or debit at Automated Vending Machines or at the Ticket Office Terminal located at Broadway station. The minimum purchase is $20. PATCO is also offering the convenience of an “autoload” feature using VISA or MasterCard to replenish the FREEDOM card automatically when the balance reaches a $5 minimum. The minimum autoload amount is $30. Values will be automatically added to your FREEDOM card the next time you touch your FREEDOM card to a target. The value of a ride is deducted from the card when exiting the faregate. Magnetic media can be purchased with a FREEDOM Card. We reserve the right to correct the balance of your FREEDOM CARD if we believe that a technical accounting error has occurred. If you have any disputes, please call the FREEDOM Customer Service Center. An investigation will be undertaken and disputes resolved within two weeks of receipt of complaint. If your FREEDOM Card is lost, stolen, or damaged, you must notify PATCO immediately by calling 1-877-FRDM-777 or 1-877-373-6777 Monday through Friday, 8:00 am to 5:00 pm. Once you notify PATCO that your FREEDOM Card is lost, stolen, or damaged, your FREEDOM Card will be turned off so that it will no longer work. Once your FREEDOM Card is turned off, it will not be reactivated or used again and you will need to obtain a replacement card. Until you properly notify PATCO that your FREEDOM card is lost, stolen, or damaged, PATCO will continue to deduct fares from your FREEDOM Card until you report your card lost or stolen. You will not be responsible for unauthorized use of your lost or stolen FREEDOM card after you properly report your card missing. Damaged cards should be returned to the FREEDOM Card Service Center at Broadway Station, Camden. You will be charged a non-refundable $5 replacement fee to obtain a new FREEDOM Card. Your new FREEDOM Card will include the balance of your old FREEDOM Card at the time you properly reported it lost, stolen or damaged. You must provide customer service with the answer to the identifying question provided on your application statement in order to get your card replaced. You may check your card balance at an Automated Vending Machine at any PATCO station or by calling (1-877-FRDM-777 or 1-877-373-6777), Monday through Friday, 8 a.m. to 5 p.m. All transactions may not be immediately reflected on your computerized transaction history. PATCO will try to use e-mail to notify you of significant card issues including the following: (1) When your credit card expiration date is drawing near; (2) when your FREEDOM Card could not be automatically reloaded with the credit card number you have provided; (3) any other optional messages you have elected to receive. The following additional terms apply to customers who elect to have pre-tax dollars from their paychecks loaded onto their FREEDOM Cards by their employers as part of the Transit Benefit Program. PATCO disclaims any responsibility for the failure of your employer to assign Transit Benefit dollars to your account in a timely and consistent manner. No refunds will be given for Transit Benefit dollars. Like all FREEDOM Card users, you are responsible for paying replacement fees if your FREEDOM Card is lost, stolen or damaged. Your participation in your employer's Transit Benefit Program and use of Transit Benefit dollars is subject to certain laws, rules, and regulations including Section 132 of the Internal Revenue Code, 32 U.S.C. Â§ 132. PATCO disclaims any and all liability for the failure of your employer to follow laws, rules and regulations that govern your Transit Benefit dollars and/or your employer's Transit Benefit Program. Your pre-tax payroll funds may only be used to pay for rides you take to and from work. PATCO reserves the right to suspend your FREEDOM Card for misuse of Transit Benefit funds or take other appropriate action. You may cancel your FREEDOM Card at any time by calling customer service at 1-877-FRDM-777 or 1-877-373-6777. If you cancel your card, the value on your FREEDOM Card at the time you cancel will continue to be available for transportation. When your card value reaches $0, PATCO will turn off the FREEDOM Card. You are responsible for all rides taken on your FREEDOM Card even if it has been cancelled. To cancel a FREEDOM Card with Transit Benefit dollars on it, you must have your employer cancel you out of its Transit Benefit program during their normal update window. Once your employer has cancelled your ability to receive pre-tax dollars on your card, you will be able to cancel your FREEDOM Card. PATCO may terminate this Agreement at any time and for any reason. Upon such termination, PATCO may block use of your FREEDOM Card and request you no longer use your FREEDOM Card. Upon PATCO's termination, you shall be entitled to a refund of any value remaining on your FREEDOM Card after costs and fees due under this Agreement or otherwise under the law have paid. If you cancel your FREEDOM Card, or your card is terminated pursuant to these terms, you will remain responsible for any and all fares that are or become due on your FREEDOM Card. This agreement shall be governed and construed in accordance with the laws of the States of Pennsylvania and New Jersey. PATCO EXPRESSLY DISCLAIMS ANY REPRESENTATION OR WARRANTY, EXPRESS OR IMPLIED, INCLUDING, WITHOUT LIMITATION, ANY IMPLIED OR EXPRESS WARRANTY OF MERCHANTABILITY, FITNESS FOR A PARTICULAR PURPOSE OR CONFORMITY WITH MODELS OR SAMPLES. YOU AGREE TO INDEMNIFY AND HOLD PATCO HARMLESS FROM AND AGAINST ANY AND ALL DAMAGE, LOSS, COST, EXPENSE OR LIABILITY RELATING TO, ARISING FROM OR AS A RESULT OF YOUR USE OF THE FREEDOM CARD. You agree to pay any costs, including reasonable attorneys' fees, incurred by PATCO to enforce the terms of this Agreement. The invalidity of any term or terms of this Agreement shall not affect any other term of this Agreement, which shall remain in full force and effect. PATCO reserves its right to change these terms and conditions at any time without advance notice. If we decide to change our terms and conditions, we will post the new terms and conditions on www.ridepatco.org at least 30 days before they become effective. The FREEDOM CARD is a type of fare media and does not entitle the user to a specific fare price or fare program. PATCO reserves the right to increase fares and the cost of fare programs in accordance with applicable law. Stored cash value will be deducted at the fare, fee or rate in effect when the FREEDOM CARD is presented for entry in a rail station or for payment of parking fees.